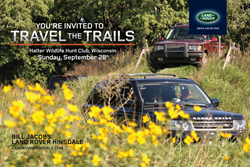 Land Rover Hinsdale’s annual Travel the Trails Off – Road Event for their customers will take place on Sunday, September 28th at Halter Wildlife Hunt Club in Pleasant Prairie, WI. The day long adventure will allow their guests to experience the off-road capabilities of their own Land Rover—something that many drivers miss out on during their day-to-day city and highway driving. Last year’s excursion had over 30 new and vintage Land Rovers and over 100 attendees. We take pride in providing fun opportunities for our customers to experience their vehicle in an off-road setting. The day’s activities include scenic trail rides along the banks of Des Plaines River, as well as exciting driving challenges on a purpose-built course with muddy trails, gravel mountains, steep terrain, and other tough obstacles that only a Land Rover could handle. Lunch is also provided for guests, as are prizes for everyone in attendance.